The Happy Day Project: Day Seven. After Leslie from Top of the Page shared her idea of Blessing Bags last year, and assembling them with my family during Thanksgiving, I knew that they would be a great project to wrap up The Happy Day Project. I just happened to be co-hosting a Pinterest party with no-blog Alicia, and decided to rope my friends into the shenanigans. Crafting plus giving? Yes please. The Evite potluck list option made it really easy for each of us to sign up for items, and mid-projects, we took a break, spread out everything on the island and began putting together our bags. During assembly we chatted about how much we take simple things for granted, like Chapstick or cough drops. It might not be much, but each item in the bags will hopefully bring some comfort and hope to those who need it most. Now each of us have bags full of basic daily necessities to pass out when given the opportunity. Leslie and I brainstormed as to what the printable to tuck into the bag should say. What is appropriate? What is meaningful? To many the homeless are nameless. To God they are not. Let them not be nameless to us. Share a bag, ask their name. 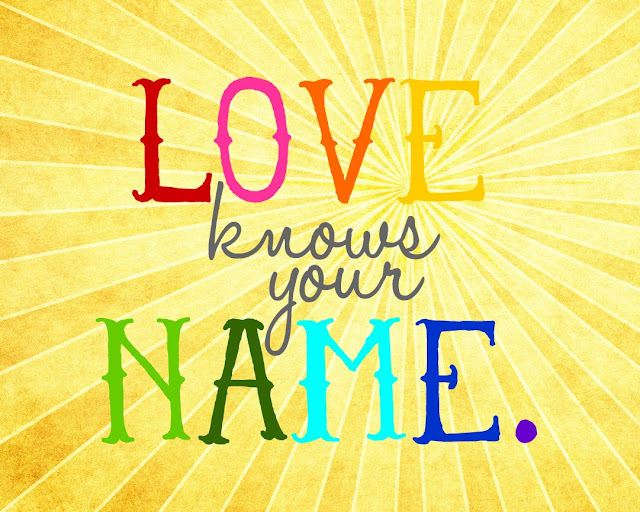 Let them know that there is love, and love does know their name. 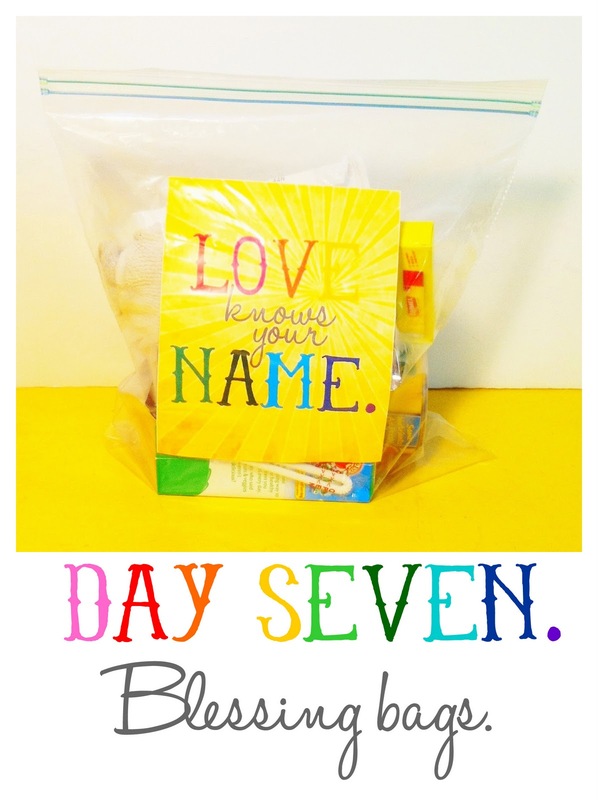 Consider assembling Blessing Bags with your loved ones this Thanksgiving. We have so much to be thankful for, and it means even more if we are able to share it. Read more about what to include here. I am thankful for you. So thankful for taking this challenge. love the sign to attach to the bag...just perfect! my husband and i were driving in the rain on 405 yesterday - saw many homeless at off ramps when we pulled off during our day of errands which led me to share about happy day project. so many hearts have been touched around the world - most all we'll ever know. just beautiful! on a side note...i hosted a pinterest crafting party and it was a blast! such a fun way for all the girls to gather and actually check stuff off our pinterest boards! I loved seeing that this was part of this weeks projects. My girlfriends and I have been putting these bags together during our weekly Bible study get togethers. We were inspired by a friend of ours who lives in California who does sock lunches. She buys a new pair of socks and stuffs them with water, food and whatever else she can and ties the two socks together. We were originally going to stuff socks like she did but ended up with too much stuff and thought they might want to wear the socks right away or get to something easier. So I had seen Leslie's post on this and the idea of the ziploc bags was great. We stuffed them in ziplocs and then into a plastic grocery bag that would be easier for them to carry. So glad you are spreading this idea around - my friend has been doing this for a number of years and she said it is really incredible to see how people are affected by this. And the whole know their name thing? You and Jeannette have really inspired me - I read Under the Overpass this week and my gift card recipient was a guy I see all the time. I remembered to ask his name and told him mine. It was pretty cool to actually meet him - he was not on the road though, off an alley so i had time to actually talk a moment with him. His name is Jimmy and I will always remember that and now can pray for him specifically! I don't know if this is mentioned in suggested items but I keep seeing bus passes as a really great thing to include. Our local UGM suggested a little card that they have available with a list of all the services they offer and times on the card to go along with bus passes. Thank you for doing this and for spreading the love! Love this idea! Just shared w/my girls & the tears fell. We are going to do this for Turkey Day too! Here in Az we see people every day w/their signs. This could be a monthly thing too! Thx for sharing w/us all. Already shopped for bag contents for Thanksgiving! We're having all the kids assemble. Also, bitter you had a pinterest party without me. Sheesh, the nerve. I just wanted to say thanks~for the whole project! Thanks for being a voice of joy and happiness and hope! It's amazing what a difference just one person can make. And when we all join forces--miracles can happen! 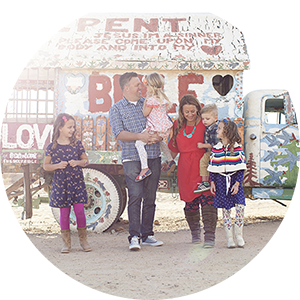 I have loved being a part of your happy day project! Let's do it again soon! Thanks for the printable, it just says what's on my heart perfectly! julie, thank you for a week of wonderful ideas. my husband and i have already started tossing giftcards in our gloveboxes -love that idea. so easy and yet so valuable. i would of never had thought of it. thanks again. I heard of this idea from another blog, and decided to do it too! I am actually an artist doing a rather large piece for Art Prize, a competition in Grand Rapids, MI. I was able to take the blessing bags (of which everything was donated) and hand out 52 of them in just over two hours. I also took photos and names of each of the people that I am going to turn into watercolor portraits. These will then all be mounted to a white board with the lyrics to "Beautiful" by Christina Aguilera hand painted on it. I believe that everyone is beautiful to God, and want to remind others of that! Love the ideas you have presented here! Thanks so much for sharing! That song is one of my girls' favorites. They heard it at VBS this year and it makes me tear up every time I hear it. I love the printable you guys made up-it's such a powerful truth!